Jeep 88-95 Wrangler; Fits Replace-A-Top 51120 or 51123. Black Denim. Manufactured to OEM tolerances by Bestop, this set will help you to keep your interior cooler with 31% tinted rear windows. Three piece tinted window sets will reduce heat build-up. And let's face it - they look cool too!! 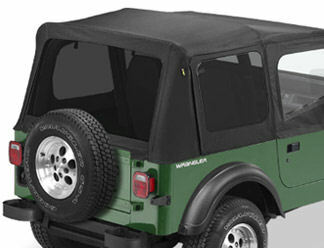 Versions for all '88-'95 Wranglers with the original top or with a Bestop Replace-a-Top with half steel doors. (won't work with full steel doors or Bestop Supertop and Sunrider).